This groundbreaking alliance connects public universities with industry and government leaders committed to the Technology Pathways Initiative. Their funding and resources are vital as universities create new technology pathways for more college women, from campus to career. The KLA Foundation aims to support and benefit the communities in which KLA employees live and work. The Foundation is dedicated to supporting four main Pillars of Focus: STEM Education, Wellness, Local Community and International Community. Xilinx is the inventor of the FPGA, programmable SoCs, and the ACAP. Its adaptable, intelligent computing solutions drive rapid innovation across technologies and industries. 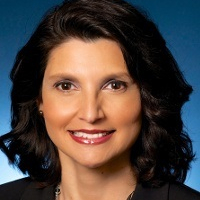 Monica Martinez-Canales is a Senior Principal Engineer at Intel Corporation. Since joining the company in 2008 she has served as a Research Team Lead, Data Center Automated Driving; and as a Director, Strategic & Applied Mathematics Solutions and a Principal Engineer. Previously, she was Principal Member of the Technical Staff at Sandia National Laboratories. At Intel, Martinez-Canales works on high-consequent applications that address energy, performance, accuracy, reliability, surety, and convergence challenges. In her role as Director of Strategic & Applied Mathematics Solutions, she manages collaboration on applied mathematics, multi-disciplinary science, and technology solutions. She also serves as Research Lead for Autonomous Clouds for Autonomous Vehicles, and is a member of the Analytics & Artificial Intelligence Solutions Group within Intel’s Data Center Solutions Group. As an interdisciplinary leader, she combines disciplines of Computer Science, Mathematics, and Biological Science. Her work involves decision making in complex and uncertain environments, big data analytics, numerical operations research algorithms, parallel programming, distributed compute, Bayesian statistics, and multi-scale/multi-physics/multi-fidelity models in machine learning and artificial intelligence. She holds a Ph.D. in Computational & Applied Mathematics from Rice University and a B.S. in Mathematics from Stanford University. Recently, CAWIT had the opportunity to speak with Martinez-Canales about the aspects of her early academic and career life that led to her current work at Intel. “When I was in high school, we didn’t have the modern web and social media to rely on. Learning about colleges took some digging, but I found a program for underrepresented students that hosted field trips to colleges. I had no idea what to expect, so those visits were important. While visiting UCSD I asked to meet with a professor, and that meeting led to a UCSD summer internship. Without question, college-bound students should pursue internships. They are great sandboxes for learning and for building a bridge from campus to career. “When it came time to apply to colleges, I assumed the Ivy’s were financially out of reach. Initially, I applied to several UC schools. Then, on a dare, I applied to Stanford. Not only was I accepted but Stanford’s financial aid package made it the most affordable option. “It’s human nature to focus on things that come easily to us as learners. While an undergrad at Stanford, I naturally gravitated to Math and Science but made a point of exploring other disciplines as well. I began to understand my own unique process for learning, integrating knowledge, and applying that knowledge over time. To this day, whenever I talk with college or grad school students, I stress the importance of not only knowing what you need to learn, but how you learn best. “Finishing my freshman year at Stanford, I signed up for a Hamiltonian Dynamics summer course at UCSD before realizing it was a graduate-level course. I’m glad I stayed in the class because it taught me how to ask open-ended research questions, which was a giant leap forward in my ability to grasp difficult subject matter. I gained an understanding of physics laws in the context of a simple math language. What I learned then became relevant later as I researched fluid dynamics, physics, and quantum computing. I developed tools in college that would serve me well in an interdisciplinary career in research. “Of course, in college, grades matter. Stanford was challenging—at times I felt like a fish out of water, but looking back, I’m glad to have been that fish! “It’s never too early to look for mentors. At every stage of academic life, students should proactively look for opportunities to meet faculty members as well as business and industry leaders. It takes courage for a young person to strike up a conversation with someone whose accomplishments they admire. It’s helpful to find common ground, make a personal connection, ask about the paths they followed to achieve their goals and let them know your goals. “I still remember Professor Doug Osheroff, my college physics professor, who later won a Nobel Prize in Physics for his work with helium. He had a great sense of humor and his love of teaching and research really came across when he taught. He instilled in his students a fervent curiosity. He loved to conduct experiments in class and if one failed, he’d just say, “Let’s figure this out!” He was okay asking others to come in and help. “These are hard problems,” he would say. I adopted that mindset and it has served me well through my academic and career life. “I had the good fortune to have met a professor who would become my future mentor while attending a conference as an undergrad. Professor Richard Tapia, now a University Professor at Rice, was the conference keynote. It was the first time I had encountered anyone in an academic leadership role who shared my Hispanic heritage. He invited me to apply to the Applied Mathematics grad program at Rice. Everything I’d known up to that point was pure math. I was glad to have found someone who could guide me on my path from college to career. “A professor’s job is to connect grad students with post-doctoral opportunities. The reputation of the school, and the academic department, matters. The relationships I developed with several mentors at Rice have had a major impact on my career. They had beautiful backgrounds and were phenomenal researchers. Students need to find such mentors, advocates who can help them feel grounded through ups and downs, particularly when the time comes to present a dissertation and defend an idea before a review board or at a conference. “My mentors helped me see what a privilege it was to bring an idea forward to be applied. There’s nothing more rewarding than seeing your ideas have impact in real, meaningful ways. They invited me to co-author papers for journals, help review grant proposals, and referee papers submitted. They also helped me with research funding, beginning with how the funding process works. Rather than a burden, writing a grant proposal became an opportunity to convey my ideas and to learn how the business of academia functioned. As a post-doc at Stanford and later as a senior researcher at Sandia National Labs, I adapted what I’d learned to the government funding process. The same is true for industry; entrepreneurs must learn to sell their ideas to the venture capital community. We’re all looking to transform our ideas into products, always competing for opportunities and resources. “It’s also important for mentors to point out that everyone experiences a defeat at some point. If you find out someone else has written about what you are working on, persevere, ask the deep questions. Tackle assumptions that have been made. A lot of people give up too soon, thinking ‘someone beat me to the punch.’ You have to ask yourself, have they really solved problem? Under what conditions is the solution valid or not valid? “Today, I work with multi-national, multi-discipline teams, including PhDs from different fields of research. Every day is different. Sometimes you’re going to be “the only one of you in the room.” The only woman, or maybe the only deeply technical one. At any given time, I might be engaged in meetings with different business units, dealing with technology transfer, collaborating on research for a current project, interfacing with government agencies, reading math papers and fielding administrative logistics for our team, or mentoring. I enjoy the variety. “In a few years’ time, some 50 billion devices will be connected to the Internet. We’re just entering what’s being called the Third Wave of Compute, which includes autonomous vehicles, drones, and freight. Anything delivering this type of autonomy will be driven by a distributed data center environment with AI and cognitive compute capabilities. Our Data Center Group works on the back end to a lot of infrastructure that will support the Internet of Things (IoT). We’re becoming a seamless compute cloud connected world, creating immersive end user experiences. Innovators are creating smart sensors, wearables, phones, TVs, cars, stadiums, and mass transit systems. We’re actively working through the math and science behind technology people think of as pure science fiction. “It’s good to see more female high school and college students studying computer science. I started programming in high school and learned new languages along the way. My first big project at Rice University involved a large-scale Earth Science project in which I had to translate my equations by writing code. Back then, it was a slow process using IBM RISC workstations. And then I got to work on the Cray Y-MP and Intel Paragon supercomputers, allowing me to numerically solve shallow water equations. I helped deliver a solution to the Texas Water Development Agency for tackling water-related issues from hurricane surges to oil spills. Something very nerdy played a huge role in helping a large government agency determine how to zone coastal activity and understand water supply impacts on food supply and the state economy. “At Intel we get to invent the future! Company leaders understand the need for basic research. We fund research through joint partnerships with other companies and universities. Our internal research group, Intel Labs, tackles a lot of foundational research. Every Intel business unit has a research component to it. Of course there’s also the investment in technology transfer, that last 10 percent of work needed to deliver products! There’s a lot of research on the drop off of women in computing going back to the 1980s. Several programming languages like C and C++ had begun to take off, joining the toolbox of languages: Fortran, Java, UNIX and LINUX. The introductory courses to these languages, and computer science, weren’t very intuitive. I think this turned away a lot of potential female researchers and technologists. Other sciences weren’t experiencing that drop off. I can trace my love of microbiology back to my intro class at Stanford, whereas learning C was not a pleasant experience. We do a disservice to budding scientists, technologists, economists and others when we don’t allow their young minds to think about possibilities…not to burden them with technology or use it as a crutch…but to explore. When Harvey Mudd began to offer intro classes in Python, more women showed up. Today, new languages are being created in flight, without a support system, which for students is hugely frustrating and detracts from learning, thus it’s less appealing. My wish for all incoming students is to have an eye-opening, positive, and intuitive learning environment. “I fundamentally believe that interdisciplinary and multidisciplinary backgrounds, with computing in the mix, are the backbone for transferring scientific knowledge from one community to another (EE, physics, CS). We need people who understand the different languages of these disciplines so they can communicate with one another. We should never underestimate the challenge of seeding new, complex ideas across different disciplines. We all need a little API, a wrapper around an idea, so people from multiple disciplines can explore and adopt it. “Some of the things we encountered in research 20 years ago are beginning to take hold in today’s neural networks and AI projects. It takes a long time to transfer knowledge from one community to another. This will happen faster with interdisciplinary teams. “I’m all for pursuing interdisciplinary degrees. Lots of folks want to pigeonhole you, but what’s going to work for you, with your particular set of talents and specialties? You can become an expert in an application by bringing your multidisciplinary background to it. There are many ways to be innovative, and when you can bring more tools to problem-solving, you can move forward by leaps and bounds. “Technology innovation is accelerating and reaching deeper into daily life. It’s important to instill in our students a mindset of lifelong learning and the importance of keeping skillsets fresh. We need to take a closer look at the learning that plays out in large organizations. College and grad students should focus on their goals while continuing to add new skills to their toolset. By the time they graduate, industry will have gone through a significant number of engineering and productization cycles and economic cycles that will impact their career opportunities. “In my experience of recruiting and hiring, the fact that a job candidate possesses a fresh, relevant skill set and has demonstrated a willingness to work hard may have the greatest impact on her employment opportunities. One of my all-time favorite quotes is: it’s your attitude not your aptitude that determines your altitude. “Now more than ever, an understanding of math and science are important to our future. We will soon be a population of 8 billion. We need to bring different people together to look at uneven access to education and jobs, population health and longevity, increasing urbanization, and how to scale technology for a heavily over-resourced planet that is being impacted by climate change. “Today’s complex, large-scale problems are leading us to question long-held assumptions and we need math, science and engineering to solve them. We’ll have to unlearn what we’ve learned, and learn new things. It’s exciting and scary at the same time. We’re on the cusp of a new future, with the emergence of new AI capabilities over the next two decades and beyond.